Columbia County's six libraries have chosen two books exploring slavery in Oregon for Columbia County Reads 2019. 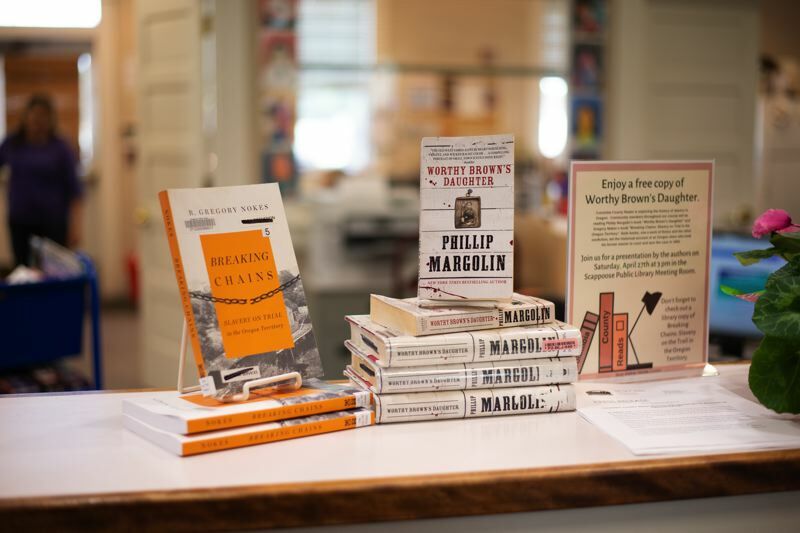 The chosen books are the nonfiction historical account, "Breaking Chains: Slavery on Trial in the Oregon Territory," by Gregory Nokes, and Phillip Margolin's fictional "Worthy Brown's Daughter." Nokes and Margolin will team up for presentations at four of the participating libraries at the end of April. "It's like an extra large book club," St. Helens Public Library Director Margaret Jeffries said of Columbia County Reads. "It's a chance for everyone to read the same book and have that common experience of sharing the same information, and it can prompt discussion." The annual program aims "to bring reading to the forefront of public discourse," according to the program press release. Local librarians say visitors have been excited about the program and the opportunity to see the authors' presentation. Jeffries, who proposed the two books, said she believed having a fiction and nonfiction option would appeal to a broader audience. The library directors, who together selected the books, "were interested in the aspect of Oregon's history," Jeffries said. The books are set in "a chapter in Oregon's history that is not one of its proudest moments, but is one that is worth illuminating," she added. Nokes' book recounts the true story of a former Polk County slave. Margolin's novel, which he spent three decades researching, was based on the story in Nokes' book. The two books are available for checkout at the six participating libraries: Scappoose Public Library, St. Helens Public Library, Clatskanie Library District, Columbia City Community Library, Vernonia Public Library and Rainier City Library. Scappoose Public Library has limited free copies of "Worthy Brown's Daughter," in addition to copies available for checkout. The eBook edition of "Worthy Brown's Daughter" is also available free through Library2Go with a library card.